Washington Reagan Airport: DCA… It’s A-OK. I am not a big fan of airports in the US. With the exception of Detroit Metro Airport (with the monorail, vaulted ceilings and fountains), most other airports in the United States are pretty disappointing: LaGuardia is a mess, O’Hare is ridiculously congested, Miami is making a turn-around but still sprawling, etc. However, I have been surprisingly pleased with my travel through Washington Reagan National. This is not a review of one of the new airports which is a marvel of modern western civil engineering, but rather I am thinking about this place as an airport that has aged well, has some character, with several key convenience benefits. The following are my key objectives which result in a “thumbs-up”, which considering its age and legacy, has held-up pretty well as far as aging airports go. This list is in priority order for me. 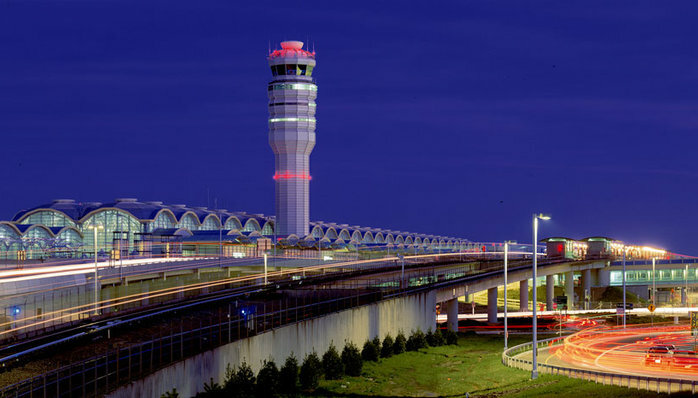 Easy access to the city – it’s only six metro stops away from Chinatown-Gallery place in the heart of the city, and there are few other places you can get from downtown to the airport in 20 mins for $2.50. Vaulted ceilings – it’s got very nice, albeit retro, vaulted ceilings in the Terminal B and C concourse areas; for airports that have low ceilings, my word association includes phrases like dingy, dirty, crowded, noisy, old; but despite its age, Reagan National has some pretty nice open spaces. Awesome views of the city – sitting on the right side of the plane, taking off towards the north, gives an absolutely spectacular view of Washington, on the left-side a stunning view of the Pentagon. Passable food options – I think, in general, that airports are improving the food options at the airport; Reagan at least has a Japanese restaurant with passable maki rolls, and a Cosi. Any airport that serves Sapporo or Kirin beer would receive some credit, in my books. Death defying top-gun landing – now, there a lot’s of people (and pilots) that think Reagan is a disaster to fly in-and-out, the low-altitude maneuvering from the north approach might have the aviation enthusiasts either exhilarated or traumatized. I fly a lot and I still get the “oh, crap”, when they make that tight turn at 450 ft above the ground. Unfortunately, I travel a lot through Terminal A, which is, in fact, horrible. Unlike Terminal B and C, this terminal is a concrete monster. I have nightmares about the echoes from the loud bellowing announcements from the JetBlue and SouthWest gate agents trying their best to get control of the travelling mob. The trick to surviving Terminal A, is to not spend much time there. Aged well, could be worse. The Bottom-Line: Reagan isn’t that bad and for someone who wants a pleasant airport experience, they can be surprised if they put themselves in the right frame of mind. ← Yes, I am Complaining about Chocolate.